Author: Claudia Böhme. Series edited by: Thomas Bierschenk, Raimund Kastenholz, Matthias Krings, Carola Lentz, Anja Oed. Since the 2000s, a video film industry with a multitude of production and distribution companies has evolved in Tanzania. Almost on a daily basis new Swahili feature films and soap operas that are recognized at a supraregional level are released. From 2006 until 2012, the anthropologist Claudia Böhme accompanied the Tanzanian creative artists and their audience. As an actress, she took part in the production of films and TV series; as a viewer, she participated in their reception in private homes and video cinemas. Her ethnography is a comprehensive description of the Tanzanian video film culture ranging from its historical roots and the appropriation of the video medium to the evolution of a film industry that has its own star cult and is strongly marked by transnationalization and globalization. Particular focus is put on cultural and political processes of negotiation, which reveal themselves in the production, distribution and reception of the films. Böhme's descriptions of the confrontations with cultural policy makers and journalists that the aspiring film makers are involved in, of their struggle for economic livelihood, acknowledgement and belonging at times read like shooting scripts that beg to be filmed themselves. 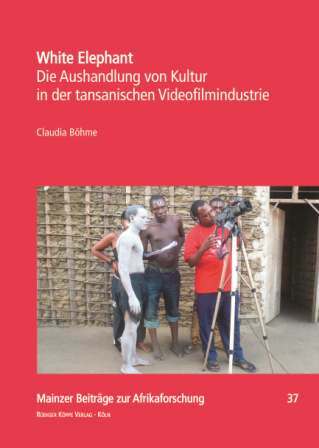 The present book not only provides the first comprehensive account of the Tanzanian video film industry but also stimulates the anthropological debate on the emergence of local media cultures in an increasingly mediatized and cross-linked world. Claudia Böhme currently works as a lecturer at the Chair of Ethnology of the University of Trier. Her research interests include media and popular culture in Africa.